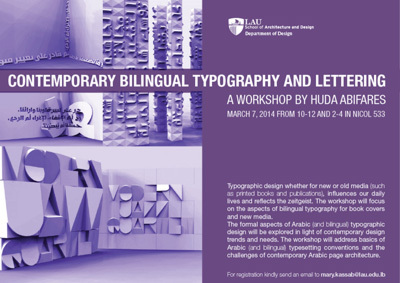 The Department of Design in the School of Architecture and Design is inviting Huda Abifares to give a workshop entitled “Contemporary Bilingual Typography and Lettering”. The formal aspects of Arabic (and bilingual) typographic design will be explored in light of contemporary design trends and needs. The workshop will address basics of Arabi and bilingual typesetting conventions and the challenges of contemporary Arabic page architecture. The event will run from 10 a.m. to 12 p.m., and then from 2 p.m. to 4 p.m.
Huda Smitshuijzen Abifares, is the founding director of the Khatt Foundation, Center for Arabic Typography. Author of Arabic Typography: a comprehensive sourcebook (Saqi Books, London, 2001), Experimental Arabic Type (Saatchi & Saatchi, Dubai, 2002), Typographic Matchmaking (BIS Publishers, Amsterdam 2007), Typographic Matchmaking in The City (Khatt Books, Amsterdam 2011), Arabic Type Design for Beginners (Khatt Books, Amsterdam 2013), and a number of articles on multilingual communication and contemporary design in the Middle East. She holds degrees in graphic design from Yale University School of Art and Rhode Island School of Design, and specializes in bilingual typographic research and design. She has worked as a designer for a number of years, in the U.S., The Netherlands, France, Lebanon and the UAE and has taught at universities in the Middle East until June 2008. She is design curator, organizes collaborative design research projects, and is editor of the Khatt Foundation online network. She is currently pursuing a Ph.D. at Leiden University while working between Europe and the Middle East as consultant on projects of cultural relevance.